It’s been a long time coming, but the audiobook of Mimi of the Nowhere has finally begun its post-production. I do not have an exact date right now for release but it should be no later than April 2019. Here are links to the first two chapters of the audiobook. 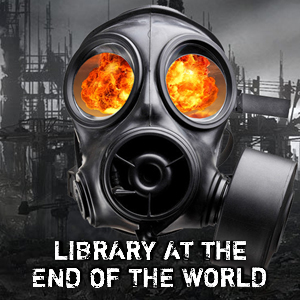 A few weeks back I was interviewed for the podcast series, The Library at the End of the World. It is a podcast series that focuses both on survivalism and on Dystopian authors. I am featured this week on episode 67 of the series where I talk about both, Mimi of the Nowhere and why it seems that humans are particularly attracted to dystopian literature. At the end, you also get survival tips from the host. Paperback of Battle for Langeles is Finally Here! After a number of complications with the production, I am happy to announce that Upon Stilted Cities: Battle for Langeles, paperback edition has finally arrived! I have also lowered the price of all three ebooks for the holidays. So you can get Mimi of the Nowhere for .99 cents, Winds of Change for 2.99 and Battle for Langeles for 2.99. Sarah of the Runners (Book 4) is currently about 60% complete and I am just about finished recording the audio book edition of Mimi of the Nowhere and hoping to have it out in January. I will also have an announcement later this month about a non-fiction book I am working on. If you are a fan of Science Fiction and in the Denver, Colorado area, you should definitely check this event out this weekend. I have an author table and I will be on four different panels discussing science fiction in the classroom, writing strategies, how to create authentic fictional religions, and reading some of my humorous work. So, if you are in the area, come visit. If not, let me know what cons are in your area and maybe I will visit this next year! The Battle for Langeles has begun! The Kindle edition of book 3 in the Chronicles of the Great Migration is here. The Battle for Langeles has begun! Book 3 in my Science Fiction series has arrived and to celebrate the first two books are on Kindle Countdown. Mimi of the Nowhere is only .99 cents for this week and Upon Stilted Cities: The Winds of Change is 2.99 for the Kindle edition. The Ruins of Langeles are up for grabs, and two walking cities stand on the brink of war. Saud has arrived, Runner 17 is near death, the women of Nowhere are missing, and Roderick’s plot to destroy Manhatsten is underway. Never before has Manhatsten faced such danger. Enemies lurk both inside and outside the city, and there is an assassin in Daniels’s ranks. It will take all the power of the sisters of the Order of the Eye to protect the city. But Alexa Turon has seen the future, and she knows what’s coming, she knows if they don’t do something, the city will fall. Can she and her new allies change the future or is too late to stop the inevitable?